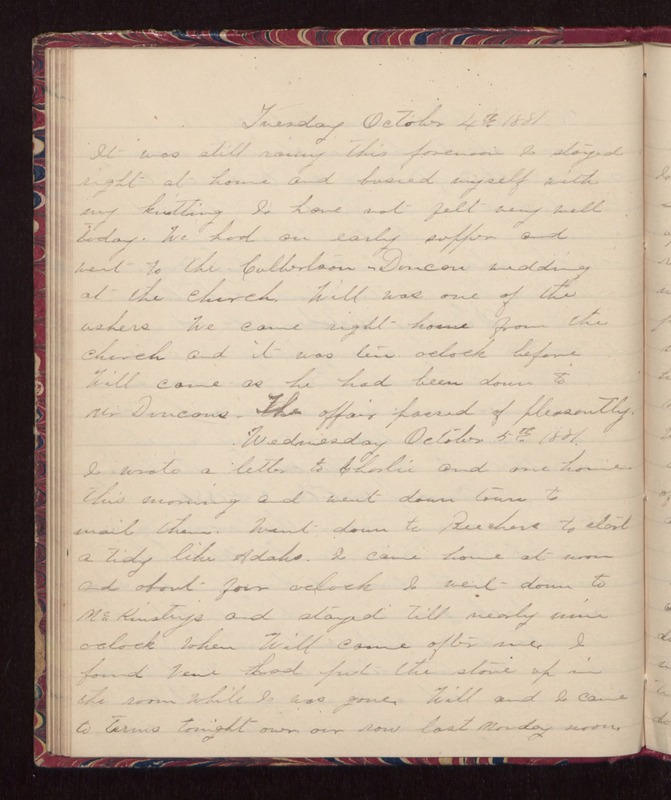 Tuesday October 4th 1881 It was still rainy this forenoon. I stayed right at home and busied myself with my knitting. I have not felt very well today. We had an early supper and went to the Culbertson-Duncan wedding at the church. Will was one of the ushers. We came right home from the church and it was ten oclock before Will came as he had been down to Mr Duncans. The affair passed of pleasantly. Wednesday October 5th 1881. I wrote a letter to Charlie and one home this morning and went down town to mail them. Went down to Beechers to start a tidy like Adahs. I came home at noon and about four oclock I went down to McKinstrys and stayed till nearly nine oclock when Will came after me. I found Vene had put the stove up in the room while I was gone. Will and I came to terms tonight over our row last Monday noon.